Location: Central Erie County, Tannery Road, Jewettville. Starting from the Village of West Falls located on Route 240, continue north on Route 240 for 1.25 of a miles to Tannery Road and turn right (east). At roughly 0.4 of a mile from Route 240 find a spot to park along the shoulder of the road. 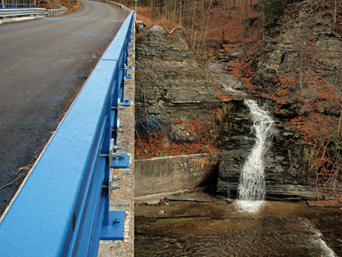 Walk eastwards along the south side of the road (being mindful of the traffic) to the center of the bridge over the West Branch of Cazenovia Creek. 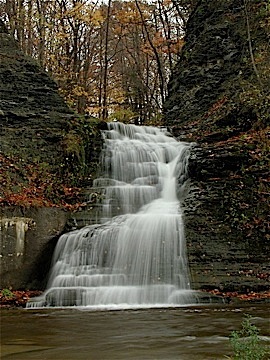 Tannery Falls is visible to the southeast. 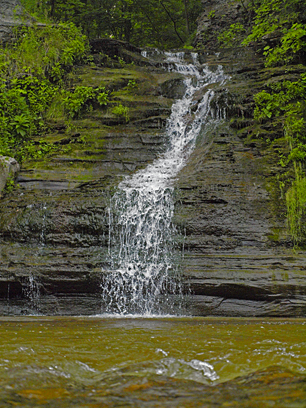 Tannery Falls is 21 feet high and has a crest that faces to the northwest and is 10 feet wide. 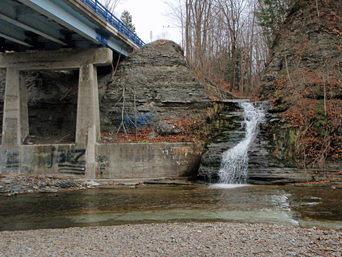 If you wish to view the falls from the level of the West Branch of Cazenovia Creek permission must be obtained from the nearby landowner. The cliff walls are primarily a light gray shale known as Angola Shale. 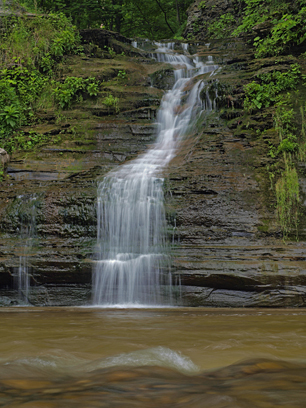 It contains concretions, beds of black shale, limestone and siltstone. It dates from the Late Devonian Epoch and is between 385,000,000 and 359,000,000 years old.